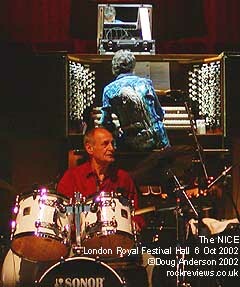 This show marked the end of a four-date UK reunion tour for 60's prog instigators The Nice. 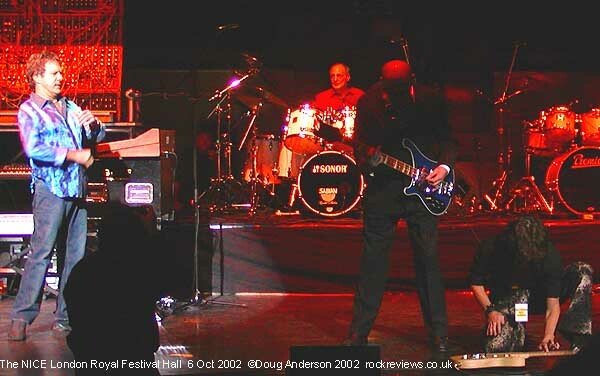 Three of the original four piece (guitarist Davy O'List was replaced by Dave Kilminster) appeared in public for the first time in over thirty two years at the launch of Keith Emerson's solo piano album, 'Emerson Plays Emerson' in April. 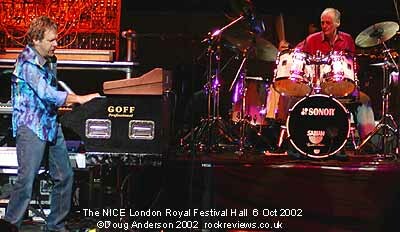 Tonight instead of a twenty-minute appearance the ticket promised an evening of Keith Emerson and the Nice. Lee Jackson (bassist & vocals) and Brian Davison (drums) were first on stage followed by the younger face of Dave Kilminster (Phil had been a last minute replacement for Dave in April due to a clash with the Ken Hensley tour). While they waited for the intro tape to finish a blue shirted figure ran across the rear of the stage to the Festival Hall pipe organ that completely failed to operate at decent volume. A rather disheartened Emerson returned to his more normal position in front of the Hammond organ for a track I expected them to finish with, 'America'. 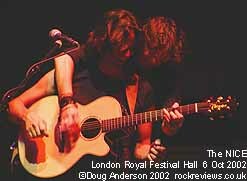 Almost from the off Dave Kilminster made his flamboyant mark even laying his guitar on the floor and playing it as if a keyboard! Keith even introduced him before Lee and Brian. A tale of 60's sexual shenanigans preceded 'Little Arabella' which featured the low-ranged vocals of Lee and more surprisingly a couple of lines by Keith. In fact Mr Emerson surprised several times during the evening by telling a couple of tales, notably about meeting Bob Dylan before 'Country Pie', and playing harmonica during 'Hoedown'. Most of the set was indeed the bands versions of other composers tunes, Sibelius and Bach rubbing shoulders with Dylan and Tim Hardin, for an eclectic mix of influences. The music was modernised and reworked but the versions were undeniably those of the Nice and none the worse for it. After an hour and a quarter the hitter and strummers departed to allow Keith a solo spot on grand piano which covered three tracks from his solo album, one of which - 'A Blade of Grass' - he dedicated to his mother who was sitting in one of the boxes. As the piano was wheeled off the others returned - except those others were now Dave plus Ken Hensley drummer Pete Riley and bass player Phil Williams! Although I expected this I'm sure a large proportion of the audience were rather shocked and wondered what was going on. Imagine their surprise (and mine) when Keith casually mentioned that they were going to do the "whole of 'Tarkus'" - one complete side of the second ELP studio album. This upset at least a couple of people as noted by the fact that they stormed out of the hall at this point. The vast majority however hugely enjoyed a major reworking of the piece. 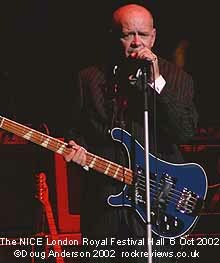 While most of the lyrics were replaced by guitar parts the 'Battlefield' section boasted an excerpt of King Crimson's 'Epitaph' with as sweet a set of vocals from Dave as ever graced Greg Lake's version. Lee and Brian returned for the set finalé, another ELP favourite, 'Fanfare For the Common Man' which featured a conglomerate band including both drummers on two kits which allowed some alternating patterns as they tried to outdo each other followed by a drumming duet. Keith followed this by turning to play the behemoth modular Moog that lurked behind him. He may not have knifed the Hammond or rocked it across the stage but the infamous ribbon controller made an appearance, sans fireworks, for a brief jam with Dave before winding up the set. They were soon called back and the full band presented us with 'Honky Tonk Train Blues' which featured both Dave and Phil playing the same acoustic guitar. So ended a two-hour set that was possibly not quite what people expected but certainly proved that the Nice could still cut the mustard. Hopefully next time Keith won't feel the need to include ELP numbers even if they are appreciated by most of the crowd - it is supposed to be a Nice show after all. This review was submitted to the Classic Rock Society for publication in their November 2002 magazine. This page is Copyright © Doug Anderson 2000 - 2002. Created: 9 April, 2002. Last updated: 16 October, 2002.